This large Cherry Blossom stencil was designed for a Cake Artist her in new Zealand and complements the other ibicci Cherry Blossom stencils, which can be found here. The design size is 6"x6" (approx 15cm square) but can be resized up to 8"x8"- just ask in the comments field when ordering. Ideal for airbrushing or stencilling with royal icing onto the top or sides of cakes. 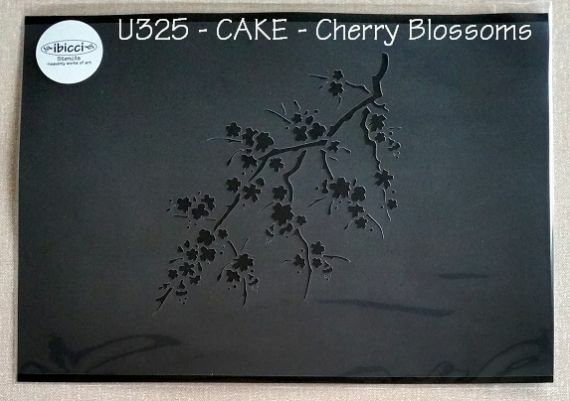 Cake Stencils measure approximately 11.75"x8.25” / 30x21cm and are designed to allow the stencils to be trimmed as required for placement on the sides and tops of cakes. Ibicci stencils are made out of reusable, sturdy food safe .007mil plastic.